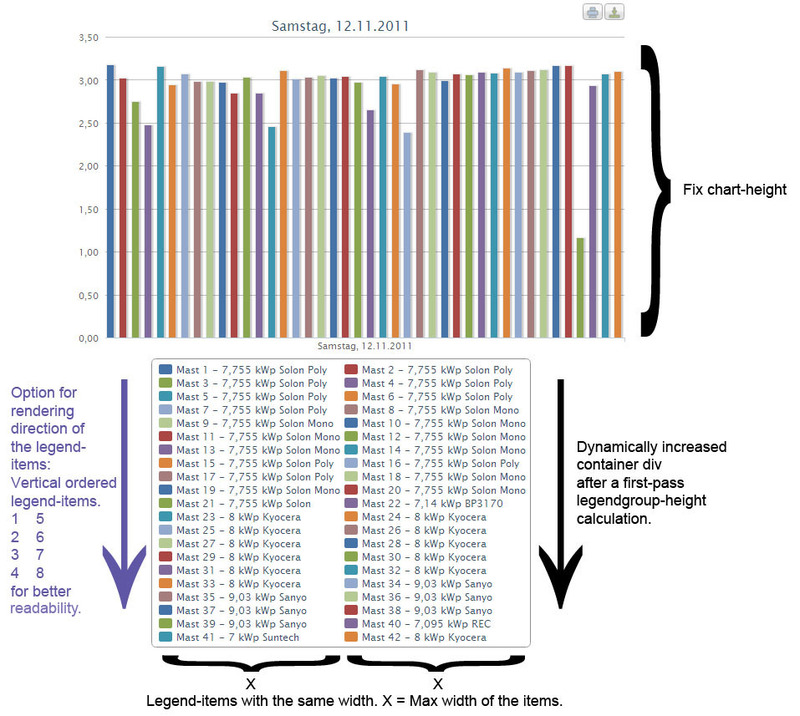 Did you see our plugin at http://www.highcharts.com/plugin-registry/single/8/Adapt-Chart-To-Legend? Any news on this issue? I have exactly the same requirements as Atys. A lot of items in the legend area and the need of fixed chart height. Auto sized should use span when writing item text legend. If you use itemwidth because of a long text there will be a waste of legend space. It would be nice if based on legend with, all item texts respect a max width splitting the text in more than one line if needed (span). In this way there's no need of a large width size legend because of a single large text item. I create dynamic reporting visualizations that take the same data but visualized in different chart types (lines, areas, pies). Since the number of series displayed in the legend is constant for these sets of charts, it would be extremely useful to have the "renderTo" option available for the legend (i.e., a set of three charts has one legend displayed beneath the charts). I see no purpose of the itemWidth property on dynamic charts.